Please note that books on semiotics published in Estonian are only included in the Estonian version of the web shop. The book is posted after the payment is made. For almost 40 years Charles Goodwin’s pioneering work has re-shaped the field of human interaction studies and has shed light on a pervasive form of social action that he calls intertwined semiosis. 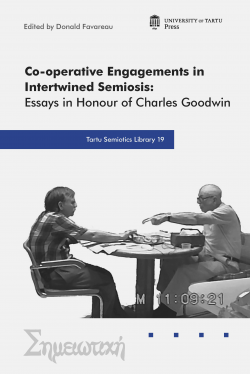 Defined as the act of laminating different kinds of semiotic materials, contributed by different actors, into local arrangements for the building of conjoint action, intertwined semiosis, Goodwin maintains, is the distinctive form of human sociality and cognition. Moreover, in the course of making his extremely detailed and astute investigations into what human sign users are doing as they make meaning with one another in real time, Goodwin’s extraordinary eye as a naturalist and mind of an anthropologist have allowed him to unearth for us the essence of the distributed, embodied and multi-modal practices of intertwined semiosis that are central to the human calibration of experience and knowledge in both every-day and institutional settings. His dynamic view on linguistic, embodied, and material resources has been shown to hold not only for co-present interaction – i.e., within the situated hic et nunc of talk as it emerges moment-by-moment – but also for historically linked chains of actions across contexts, generations, historical moments and even species. Goodwin’s work thus constitutes a fundamental contribution to the study of human ways of knowing, acting and being, and has inspired not only at least two generations of interaction scholars, but also linguists, cognitive scientists, semioticians, anthropologists, and philosophers. Accordingly, one finds in this volume a wide-ranging assortment of reflections and analyses, each of which constitutes a deeply-felt testament and tribute to Charles Goodwin’s extraordinary ideas, career, personality and life, and together forming the most comprehensive single-volume assessment to date of his outstandingly original and profound oeuvre in the analysis of human meaning-making.